QUESTION: What’s worse than rain canceling batting practice? ANSWER: When it stops raining just before the gates open and hundreds of fans still show up early. That’s what happened yesterday. Very few opportunities. Lots of competition. I knew I was in trouble. When I ran inside the ballpark at 5:40pm, the tarp was covering the field, and there was only ONE baseball in use. Armando Benitez and Yamid Haad were playing catch in shallow left field. I was the first one there. I asked Benitez politely if there was any chance he could toss me the ball when he was done. He ignored me. Twenty other fans came down to the front row. When Benitez finished, he tossed the ball to some other guy who wasn’t even wearing a Giants cap. Several other Giants pitchers came out to throw. When Scott Eyre finished, I asked him for the ball. He turned to toss it my way and then stopped. “I gave you one yesterday,” he said and threw it to someone else. Jeremy Accardo began throwing with…someone. I wasn’t sure who because his windbreaker was covering his jersey. I asked the Giants fans. They didn’t know. There were other people waiting for the ball, but no one knew the guy’s name. All I had to do was be the first person to figure it out, and the ball was mine. They were almost done. I had to act fast. Luckily, Noah Lowry started signing autographs nearby. I asked him who was throwing with Accardo. YES! Brad Hennessey! Of course! I moved back in position in the front row and waited for the right moment to put in my request. That moment came one minute later when Accardo held up a fist with his index and pinkie fingers pointing skyward. Two more throws. Big sigh of relief. I thought I was going to get shut out. I always start worrying when I don’t get a ball within the first 10 or 20 minutes. I needed to fiind a way to get three more balls. If I didn’t, my 35-game streak with four or more would end. I was also thinking about reaching double digits for these two games. That meant I’d need FOUR more. 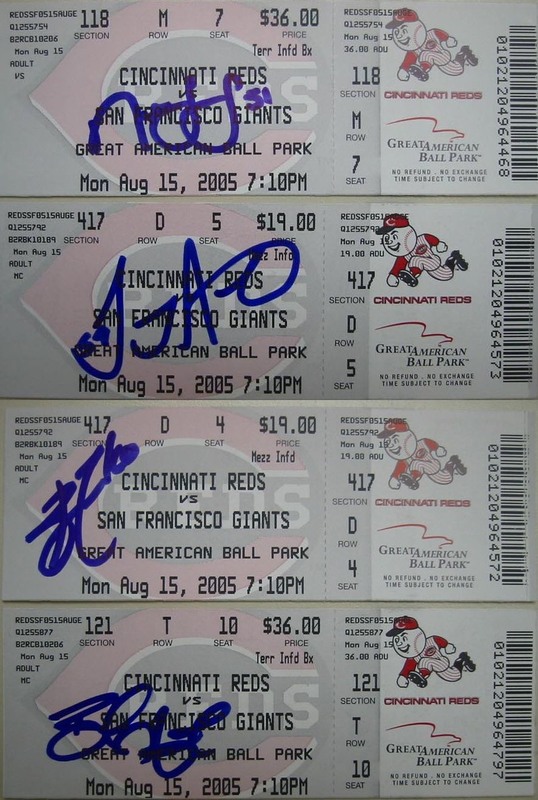 For a few minutes, half the Giants’ pitching staff was signing autographs along the 3rd base line, and I got whoever I could get on the extra tickets I’d collected the day before: Lowry, Accardo, Brett Tomko, and Hennessey. Only then did I realize that I’d just snagged #2,600. The field was empty by 6:10pm except for the grounds crew. I went to the upper deck to check out the views and take some pics. (I’m holding ball #2,600.) There was a pregame tee-shirt launch, and I ended up getting one and giving it away to couple of kids who battled for sole possession. I made it back down to the 3rd base line just before the national anthem. Randy Winn was stretching and running, and I begged him to come over and sign. He ignored me and went straight to the dugout. At 7pm, Deivi Cruz and Pedro Feliz started playing catch in front of the dugout. I hurried over there and walked right down to the empty front row. There wasn’t an usher in sight. I was the only fan with a glove. If ever there was a guaranteed ball, this was it. Cruz ended up with it. I called his name and he tossed it to…a kid all the way over near 3rd base. Four Reds were already throwing in front of the 1st base dugout, but because of the terrible layout of the ballpark (which forced me to make a long detour through the concourse to get there), they were gone by the time I arrived. The game began, and I had ONE ball, but I was still determined to get four more–or at least three more–so I decided to move back and forth every half inning from the 1st to the 3rd base dugout (switching from my Reds cap to my Giants cap, of course) and try to get down to the front row as the fielding team came off the field after the 3rd out and hope that they brought the ball with them. I knew my best shot would be during the first few innings, before every kid in Cincinnati would catch on and try to do the same thing. Luckily, the attendance was only 16,954–the lowest in the major leagues last night, ho ho ho–so there were empty seats just about everywhere I went. I’d forgotten how nice that is. I’d also forgotten how nice it is to NOT be recognized (in a bad way) by every usher and security guard in sight. No one knew me. No one asked to see my ticket. No one said a word to me all night. Omar Vizquel grounded out to short. Lance Niekro popped out to 3rd. I ran down the steps to the front row and saw Aurilia flip the ball to left fielder Adam Dunn on the way in. 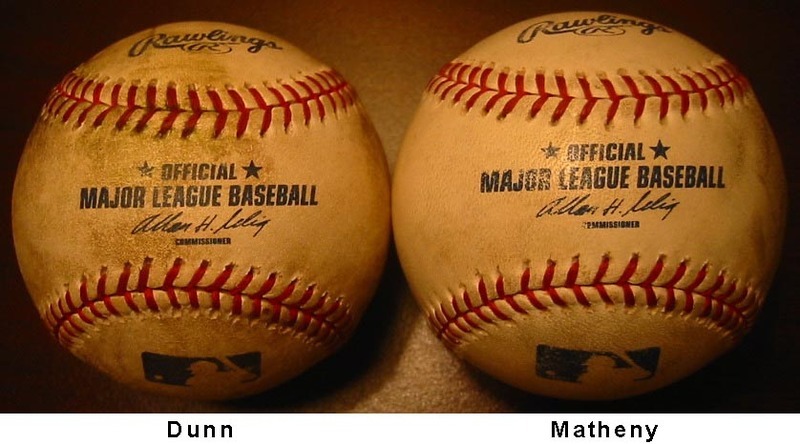 I shouted non-stop for five seconds as Dunn approached, and before he reached the warning track, he under-handed the ball in a high arc in my direction. I quickly realized that he’d thrown it too high. I took a step back, paused for a split-second, jumped as high as I could, reached even higher, caught the ball, and landed on a beer vendor who’d crept up behind me. I apologized. He was fine. I took off for the 3rd base side and put on my Giants cap. Sean Casey grounded out to Niekro at 1st base to end the inning. Niekro tossed the ball to the ump on his way in. 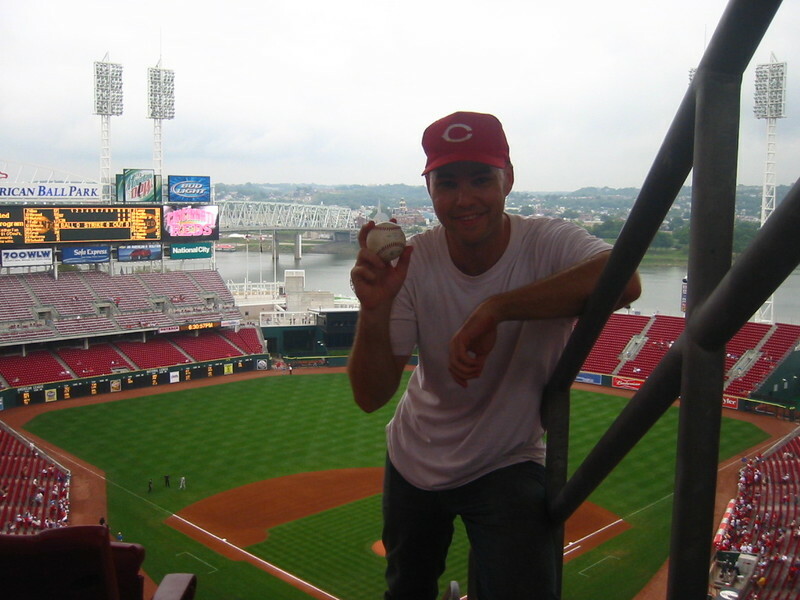 I ran back to the 1st base dugout and put on my Reds cap. Randy Winn grounded into a force play to end the inning. (Serves him right.) Second baseman Ray Olmedo dropped the ball on the mound on his way in. I ran back to the 3rd base dugout and put on my Giants cap. Olmedo struck out to end the frame. (Serves him right.) Catcher Mike Matheny took the ball with him and tossed it to me. Bam! Just like that. No competition. I was enjoying this new strategy, but would it hold up for seven more innings? The players took most of the 3rd out balls with them but tossed them to various people in different sections. After the bottom of the 6th, Niekro tossed one just two feet to my left, but by this point, there were so many kids packed into the front row for these balls that I had it knocked out of my glove. I couldn’t believe it. I was outreached by a 10-year-old (for the second time this month). By this point, a bunch of fans several rows back had caught on to what I was doing and got a real kick out of it. 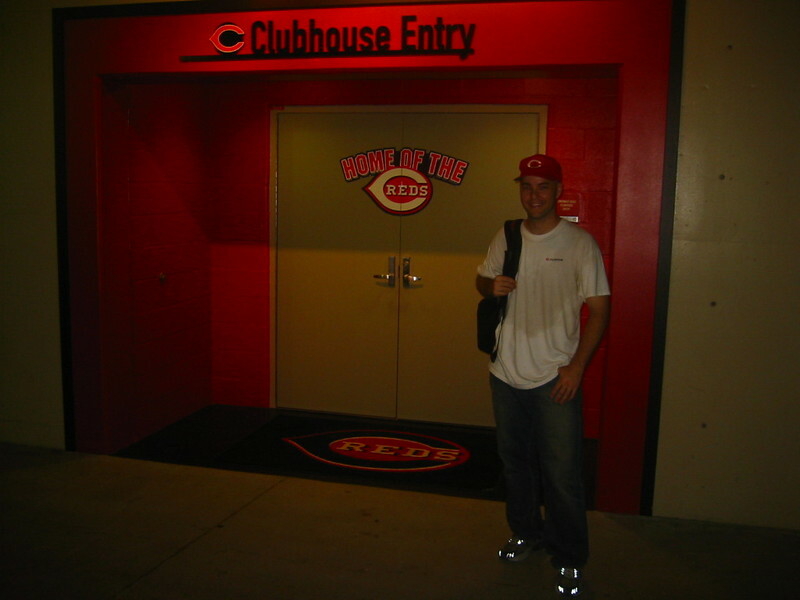 Every time I returned from the Reds’ dugout, they asked me how I did, and asked me dozens of other questions as well. It was fun. In the 7th, someone hit a lazy foul ball that landed RIGHT where I’d been sitting the night before for the last four innings. In the 9th, I tried to outsmart Dunn (who’d replaced Casey at 1st base) by moving one section to the left of where he’d tossed me the ball. What did he do? He lobbed it right where I’d been. Double digits at Great American Ball Park: not happening. The game moved to the bottom of the 9th with the Giants winning 10-7, so I returned to their dugout for one final shot at extending my streak. Ken Griffey, Jr. homered to right. Dunn struck out. Wily Mo Pena struck out. Austin Kearns grounded out. Ballgame over. Final score: Giants 10, Reds 8. I got into a great position in the front row and BEGGED for a ball from every player and coach. “I can’t believe it’s gonna end like this,” I thought, my last chance virtually gone. There were still a few relievers walking in from the bullpen. But no. Nothing. Streak over. But there is good news, if we can look at this in a glass-half-full kinda way: I now have a record streak of 36 consecutive games with at least three balls. My previous record was a 33-gamer from June 30, 1998 to June 22, 1999. Actually, I have more good news. 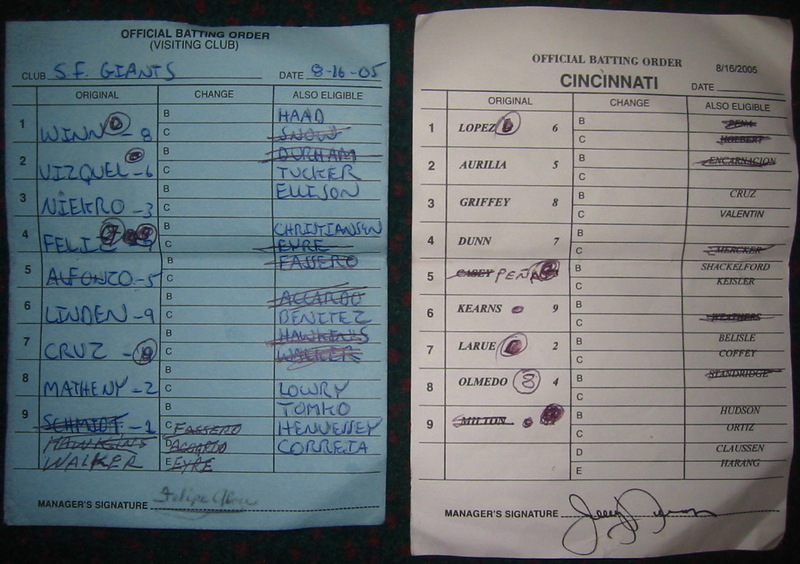 Felipe Alou gave me the lineup cards again. This time, I saw him pull them right out of his back pocket. No one hit for cycle, but this game was still a bit historic. How often do two guys on the same team go 5-for-5? Cruz and Feliz did just that. I decided to get some more ticket stubs, so I headed up to the concourse and asked the first people I saw…a family of five. The father asked me why I wanted them. I said I’m from out of town and that I thought they’d make good souvenirs and blah blah. He told me he’d left them at the seat and started heading back there. “It’s no problem,” he said and headed across the concourse to the club entrance. Turns out he said “suite”–not “seat”–and he came back out with a stack of big, gorgeous tickets. He gave me his copy of the Reds Magazine, too, and we kept talking. He asked about my trip and, I suppose, appreciated my passion because he offered to show me the entrance to the Reds’ clubhouse. “Hey,” I said, “I’m the one from New York City. YOU need to watch out.” They all laughed and kept asking me questions about my hobby. Then I asked how they were able to get down to the clubhouse. “Well…” He paused. “We actually own a very small portion of the team,” he said quietly. “Thirteen percent!! !” shouted his youngest son. His parents laughed an embarrassed laugh. I didn’t see any players, just a bunch of employees–or so I thought–carrying heavy boxes. Turns out one of the guys was Tom Browning. My tour continued into the Diamond Club where, at the far end, there were several windows that looked into the runway that connects the dugout to the clubhouse. During the game, the fans down there get to see the players going back and forth. There was even a partial view of the batting cage. We went back out into the tunnel and ran into former major league pitcher and current Reds TV broadcaster Chris Welsh. Chris and I walked off together toward the TV trucks. He asked me question after question. (I wanted to ask HIM questions.) I showed him my baseballs and autographs and lineup cards. When we reached the truck, we found out that the camera crew had already left, so he introduced me to the producer who, after hearing my story, said he was interested in having another crew get a hold of me in Houston, so I gave him my e-mail address. “What’s your cell phone number?” he asked. I needed a cab, but there were none. Yamid Haad walked outside (why couldn’t it have been Randy Winn?) and stood next to me. He needed a cab, too. While we waited, I got his autograph. Then Omar Vizquel walked outside. “I can’t right now,” was all he said, even though I was the only other person out there. Haad took the first cab. Vizquel took the next one. I got the one after that and went back to the hotel. • 171 balls in 26 games this season = 6.6 balls per game. • 410 consecutive games with at least one ball. • 2,602 total balls (moves me ahead of Steve Garvey and into 70th place on the all-time hits list…next up are Rabbit Maranville and Tim Raines at 2,605). Minute Maid Park will be opening in an hour and a half (I think). I still want to end this trip with 20 balls. That means I need 12 in my next two games. Wow Zack, you are a lucky guy. Just a random family you picked out happened to be co-owners of the team! That’s insane. Did the Houston camera crew contact you yet? I’m watching the Cubs-Astros game on ESPN right now, maybe if you catch a foul ball they will show you on TV. Good luck. 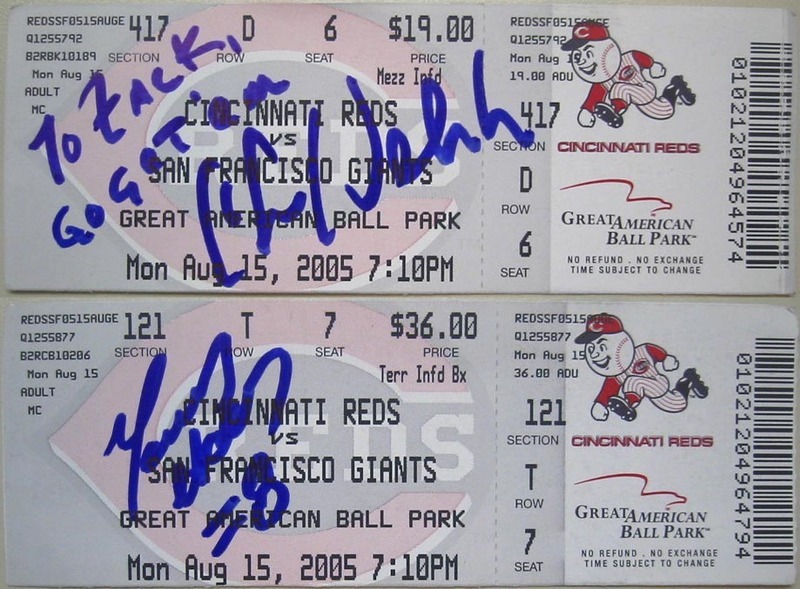 WHY IN THE FREAKING WORLD WOULD YOU GET TICKET STUBS FROM RANDY WINNS CYCLE GAME SIGNED BY ANYONE BESIDES RANDY HIMSELF?!?! EEEK!! Cmon now! That’s sweet about that family and Chris Welsh. I dont get it though, whats happening with the producer and stuff? I guess you could call it the ‘not so great American Ballpark’. Well, for baseball that is, it’s the best place in the world to snag lineup cards. Running into that family was one of the flukiest things that’s ever happened to me. I know I’m lucky. I try not to take it for granted, but I suppose I still do sometimes…like when I complain about “only” getting three balls. No word yet from the producer or the TV crew. Doesn’t look like it’s gonna happen. You’d think they would’ve gotten a hold of me by now if they were really interested, right? Oh man. Chris Welsh autograph link not working? Well isnt this a travesty…oish. I haven’t been to many games, school is back in session (I’m a teacher). However, I’m hitting all 3 Twins games in Ameriquest. Should get at least 5 balls a day, since I’ll be wearing FULL Twins gear. Don’t look now people, but who is rising up in the Central? Maybe??? Yeh, go Twins! drosenda – are you a Twins fan? Zack, good things happen to good people and thats why these sorts of things happen to you. Don’t even think about them because if you did, they might stop occuring to you. Awesome blog, but I have to catch up on more from your trip so far. Good luck and get a cell phone, will you? LOL!!!! That is so awesome Zack!!! I had the privilege of doing the same thing at Dodger Stadium, and I met all the broadcasters at a Braves-Dodgers game. I talked with guys like Hall of Famers Don Sutton, Vin Scully, Jaime Jarrin. Hey, good thing is, you’ll get free tickets to Reds games!!! Can’t wait to see how you did in Houston. That game went by quick, I had turned on ESPN with a half-hour left and it was already done! No cell phone. Not yet. Leave me alone. There are like ten moments each year when I wish I had one…it’s not worth it Anyway, thanks. You’re nice. It’s the greatest, isn’t it? Sometimes, when things like that happen, it feels like nothing else in the world matters. I can’t tell you anything about the Astros’ autograph tendencies. Maybe the grocery man or George have some thoughts? Thanks for your continued interest. As you’ve read by now, the first game in Houston was da bomb.